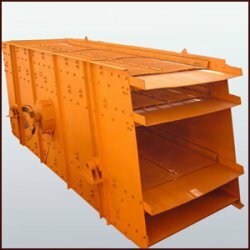 Accurate works manufactures Vibrating Screens that are used in grading and sieving purposes. It has lots of features in it like Reliable, Durable, High screening capacity, Eccentric type system, No transmission of screen panels, Rigid and vibrating. Its is available in single, double and three deck design which can be customized as per your requirements. Fax :+91 0265 2644 408.